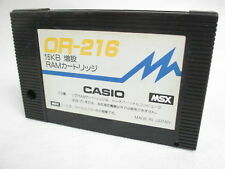 Home » Forum » MSX Talk » General discussion » Why not Pascal / C instead BASIC? I did use BASIC for GR8cfg's first iteration, it was a quick way to create a setup tool for the GR8NET cartridge. I normally program in C, so now I am attempting to create it for MSX-DOS, that creates so many better options than in BASIC. You can stop the program by pressing the CTRL+STOP key combination. For Pascal I recommend Borland turbo Pascal, version 3.3f by Frits Hilderink. I'm familiar with Turbo Pascal 3 from the PCs and using it earlier with the Amstrad CPC under CP/M, though switched to Hisoft Pascal when I could see I wasn't making any friends writing machine specific programs, plus they were limited to CP/M 2.2 and wouldn't work in CP/M+. Consequently, programs I posted on World of Spectrum are quite large and written in Hisoft Pascal, just thought it would be interesting to see how the different versions of Hisoft Pascal handled it, but haven't been able to find a download for Hisoft Pascal on the MSX - assuming there are Copyright issues regarding commercial software?